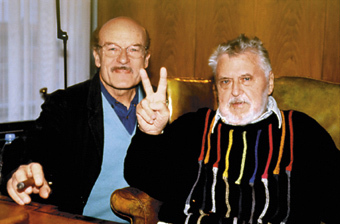 In January 2002, the director Volker Schloendorff and the producer Horst Wendlandt had an interesting conversation, which was filmed by the cameraman Andreas Hoefer. Horst Wendlandt, who received over 38 Golden Screen Awards for his films, talked about his film work since the 1960s. The dialogue between the "old and young filmmakers" provides a fascinating spectrum of German cinema of the recent past. Their conversation is complemented with numerous excerpts from some of Wendlandt's most well-known films. Volker Schloendorff's proclamation of the necessary development of "conservative film" to Autorenfilm is countered by Horst Wendlandt, with impressive examples of his success, as well as clips from films by Loriot, Rainer Werner Fassbinder, Ingmar Bergmann, Otto, Edgar Wallace and Karl May. Volker Schlöndorff has been active for more than 50 years. A selection of his award-winning films includes: YOUNG TÖRLESS (1965), BAAL (1970), THE SUDDEN WEALTH OF THE POOR PEOPLE OF KOMBACH (1971), THE LOST HONOR OF KATHARINA BLUM (1975, co-directed with Margarethe von Trotta), FANGSCHUSS (1976), GERMANY IN AUTUMN (1976, together with Stefan Aust, Alexander Kluge, et al), THE TIN DRUM (1979), CIRCLE OF DECEIT (1981), SWANN IN LOVE (1983), DEATH OF A SALESMAN (1985), A GATHERING OF OLD MEN (1987), THE HANDMAID'S TALE (1990), VOYAGER (1990), THE OGRE (1996), PALMETTO (1998), THE LEGENDS OF RITA (1999), EIN PRODUZENT HAT SEELE ODER ER HAT KEINE (2001), TEN MINUTES OLDER: THE CELLO (2002), THE NINTH DAY (2004), STRIKE (2006), ULZHAN (2007), DAS MEER AM MORGEN (2011), DIPLOMATIE (2014), and RETURN TO MONTAUK (2017).